PARADISE, CA – “Workers fanned out across the cinders, looking for those who didn’t escape the inferno that transformed this town into a wasteland.” That was the lead-in of a Daily Beast article about the California wildfire that destroyed the town of Paradise, California. The fire came upon the people so quickly that there was barely time for fortunate few to escape. As of November 19, 2018, 80 people are known dead and nearly 1,000 are missing in a fire that burned acreage at the rate of 80 football fields per minute. The fire moved so quickly that numbers of people were burnt alive in the cars trying to escape. We may eventually learn that more than 1,000 people died in the fire because no one had been able to warn them or rescue them before it was too late. How many people would have survived if only someone had warned them and showed them the way to escape the fire? One of our greatest responsibilities as Christians is to make others aware of the impending danger of missing Paradise and being lost for eternity. We are the only ones who know the way of escape. We must get to the people before they are lost in the fire of eternal judgment. There are three kinds of people who need our help. Those who are unaware of the danger. These people are unaware of God’s Word that tells us of our sin, His righteousness, and judgment to come because of our sin. (See John 16:8) We refer to these people as “the unreached.” They need to be made aware of the danger and be shown the way to escape. Those who see no way to escape. Those who are not concerned about the danger. 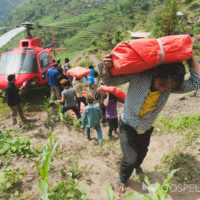 We are God’s chosen messengers to warn the unreached, the hopeless, and the unconcerned. We are the ones the Lord has sent to make people aware of the danger, to show them that Jesus Christ is the only way of escape and that only Jesus’ righteousness is sufficient for our survival and eternal salvation. If any of us had been in Paradise prior to the fire and known the way to escape, we would have warned others and shown them the way. Not everyone would have listened, but some would have. We cannot convince everyone but that is the Holy Spirit’s job. Ours is to explain the danger, point them to the way, and lead them to the safety and security that is available through faith in Jesus Christ. There are millions in South Asia, Gospel for Asia’s geographical ministry area, who are unaware, unable to see a way of escape, or unconcerned. Please pray for our field partners as they reach out to people to lead them away from the sure and certain danger to the sure and certain hope that is in Jesus Christ. Let us commit today to bring the Good News to the unaware, the unable to see, and the unconcerned who are numbered among our own family, friends, and neighbors. This entry was posted in Essays and tagged judgment, Paradise, righteousness, sin, Unreached. Bookmark the permalink.